went even further. That gave Dr. John A. Serri an idea. What if you could use those high-resolution screens for a personal eye test? With PPIs exceeding 400 to 450, a person with 20/20 vision could be measured at about a four-inch distance. Why not build a viewer to focus tightly on the screen, and run acuity tests? He began running experiments and realized not only would it work, but it could also be done at a price any consumer could afford. The implications were astounding. Instead of a one-shot test at the optometrists for $200 to $400, you could take several tests and average out the results to get a true measurement. Our eyes are analog devices, and anytime you measure an analog device you take multiple tests to average out the noise. Our eyes also change from day to day and during the day, even more so if one’s diabetic, or has high blood pressure. Serri set about developing an app, and an apparatus, and in early 2015 formed EyeQue in Newark, California—gateway to Fremont and Union City. A year later he had working prototypes and by the end of 2016 he had manufactured goods and kicked off a Kickstarter campaign. It was good and won the Best of Innovation in the Fitness, Sports and Biotech category at CES 2017. By February 2017, he was shipping products to customers. Serri built two models, a monocular and a binocular version. 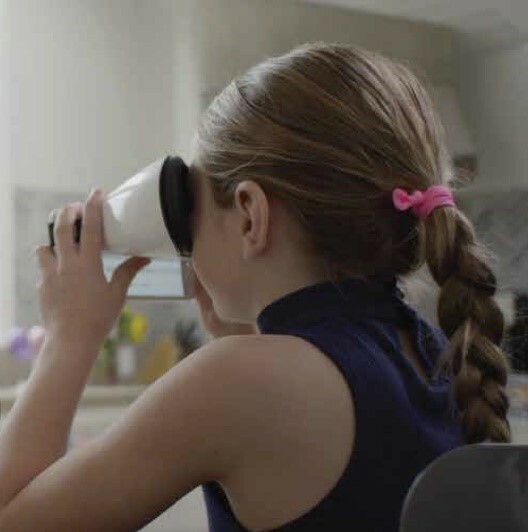 The Personal Vision Tracker (monocular refractive error measurement) was introduced in October 2016; the Insight (binocular visual acuity screener) was introduced one year later. The monocular version, with the app, is only $30 and can be used at home by anyone six years or older. The test results are immediately processed on EyeQue’s cloud-based processor and returned with spherical, cylindrical, and axis figures—the same type of values an eye doctor uses to generate a prescription. Therefore, one can use EyeGlass Numbers to order new glasses from online retailers such as zennioptical.com. In addition to less expensive examination costs, and probably more accurate results, one can save on low-cost online glasses. As you age, you’re more likely to experience vision issues such as age-related macular degeneration, cataracts, and other conditions. The EyeQue screener could detect such issues early so one wouldn’t have to wait until the next optometrist appointment to find out. Your vision records are stored in the cloud and accessible from the EyeQue dashboard, so you can view them anytime from your smartphone or computer. And, if you choose, you can compare your vision history over time and share results with your doctor, which is probably a smart thing to do. A recent feature the company added is the personalized usage report. 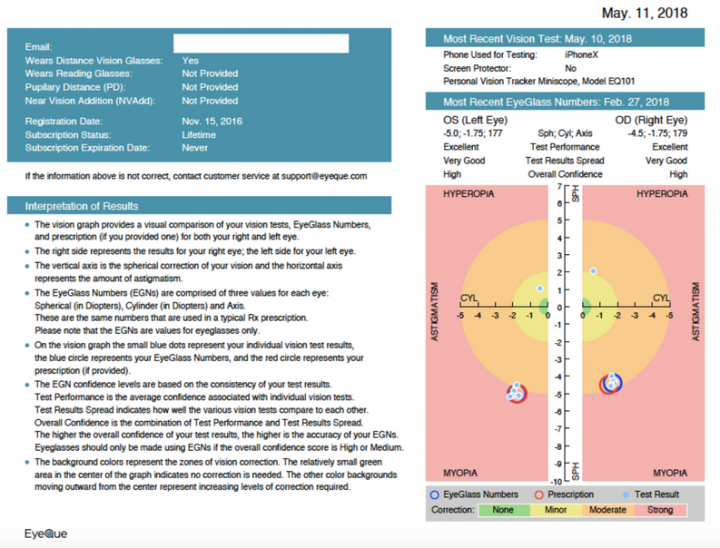 This report can be accessed on EyeQue.com’s desktop page and will give you a variety of information on your eyesight, based on your Personal Vision Tracker test results. The system requirements are a smartphone with a 4.7-inch, 300 DPI screen, >800 lines resolution—pretty common these days. 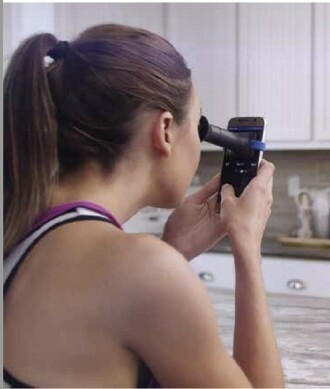 The binocular version has an additional measurement since both eyes are involved, it can also measure pupillary distance, which is needed to order corrective glasses. The binocular version simulates a 6- m (~20 ft) distance for the tests. The binocular version is $89. The cloud processing is done through an annual subscription which is about $5. Our first reaction was: how many times do I go to an optometrist—every other year maybe? So maybe the business model is based on losing the viewer? But as Serri pointed out, one device can be used by the whole family. And if you are diabetic, you need to test your eyes frequently. I tried it and the test only took a little over two minutes, was easy, and gave instant results. Serri told me he is working on an astigmatism test as well. It is estimated that approximately 33% of the U.S. population has some degree of astigmatism and that 70% of all Rx's written in the U.S. include astigmatism correction.